Custom-fit machine construction for digital glass printing: At the Glasstec stand, Thieme Development Engineer Uwe Bürklin explained the new digital print systems for industrial glass printing. Custom-fit machine construction for digital glass printing: At the Glasstec stand, Thieme Development Engineer Uwe Bürklin explained the new digital print systems for industrial glass printing. Solid machine construction and first-class printing quality have always distinguished the screen and digital printing machines of THIEME GmbH & Co. KG. These qualities were yet again demonstrated by the South-Baden manufacturer at this year’s Glasstec in Düsseldorf which ended on 26 October. The digital printing systems for industrial applications presented at the show enable fully-automatic printing with short cycle times and highest print quality and precision for the imaging of the finest printing patterns. The two new machines – for the ceramic printing on automotive glass and appliance glass/technical glasses, respectively – generated a lot of interest among the visitors. 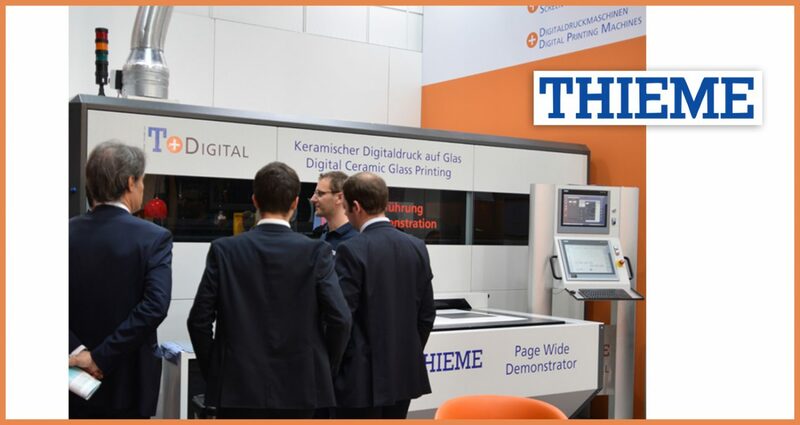 The Thieme booth offered detailed insights into the function of the high-precision and highly productive “Page-Wide”-print shuttles as well as the automatic printing head cleaning system which is indispensable for industrial applications in the glass sector. “Combined with our proven glass transport solutions, the new machines and options enable the realisation of highly efficient, automated manufacturing processes in the industrial sector”, explains Christian Schweickert, Thieme Sales Glass Printing, who was at hand to answer many interesting visitor enquiries. In addition to the innovations in the digital printing sector, Thieme presented new and useful options for screen printing. Furthermore, a new version of the fully automatic flatbed screen printing system THIEME 3000 GS was introduced as a concept; like its digital sisters, it is intended for printing on appliance glass (e.g. displays and control panels of household appliances/white goods) and technical glasses (e.g. sensor glass). In addition to the classic formats up to 650x900mm, the machine enables small panels with sizes of 150x50mm to be printed with the same machine and subsequently be safely transported through a multi-colour printing line, including dryer. “Whether digital or screen printing, when it comes to industrial glass printing, Thieme is perfectly positioned”, concludes Christian Schweickert. The THIEME engineering works was founded in 1960 by Werner Thieme who thus laid the foundation for today’s company. In the printing systems and polyurethane business sectors, THIEME GmbH & Co. KG currently employs about 350 people around the world. The headquarters of THIEME is in Teningen, near Freiburg in South-West Germany. The company serves its customers with sales and service subsidiaries in France and the United States.